Here’s the second beautiful raffle quilt that I saw in the Houston area when I was teaching there. 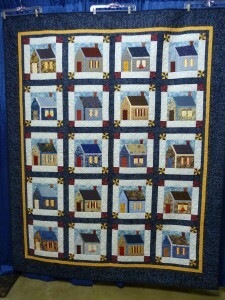 This one was made as a fundraiser for the Mainland Morning Quilt Guild. This group meets on the morning of each third Thursday of the month at Bayou Vista Community Center. 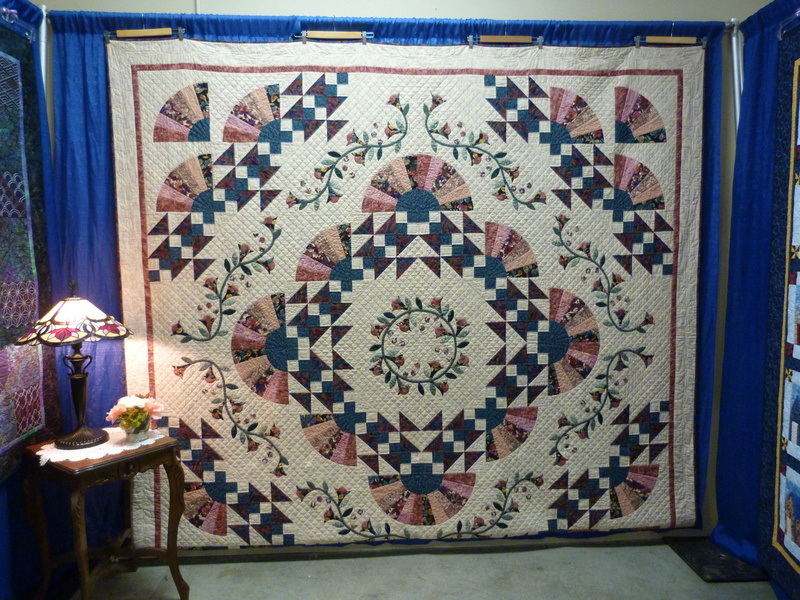 The queen-sized quilt is called Bird’s Eye View and was pieced by Carolyn Hughes and machine quilted by Errol “Pete” Hughes. 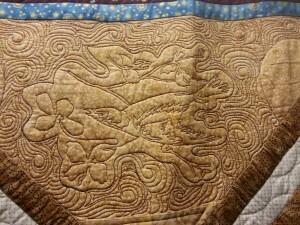 Here are a couple of detailed shots so you can get an idea of the intricate pictorial quilting patterns. At two of the quilt guilds where I lectured recently in the Houston area of Texas, nearby quilt guilds brought their raffle quilts to sell tickets and promote their guild activities. These quilts were gorgeous so I wanted to share them with you. 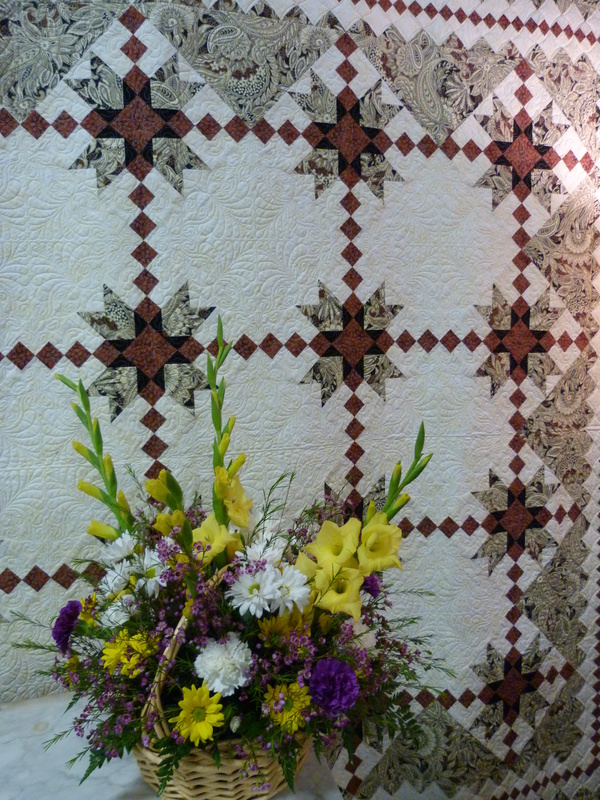 This stunning red quilt was presented by the Bay Area Quilt Guild. 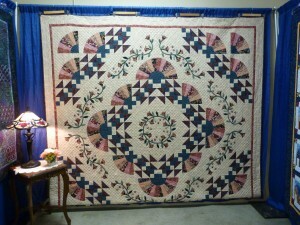 Pearl Anniversary, 68″ x 82″, was pieced, appliqued and quilted by Marcia Brenner and Melba Brenner. 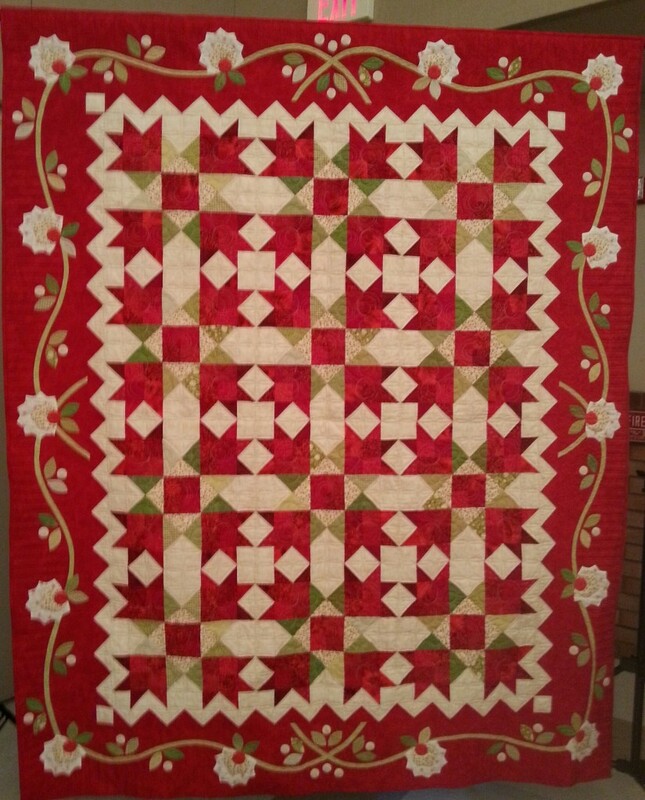 It is based on the design “Robin’s Roost” by Cyndi Walker of Stitch Studio, found in Pretty Patchwork Quilt, Traditional Patterns with Applique Accents, published by Martingale & Company. 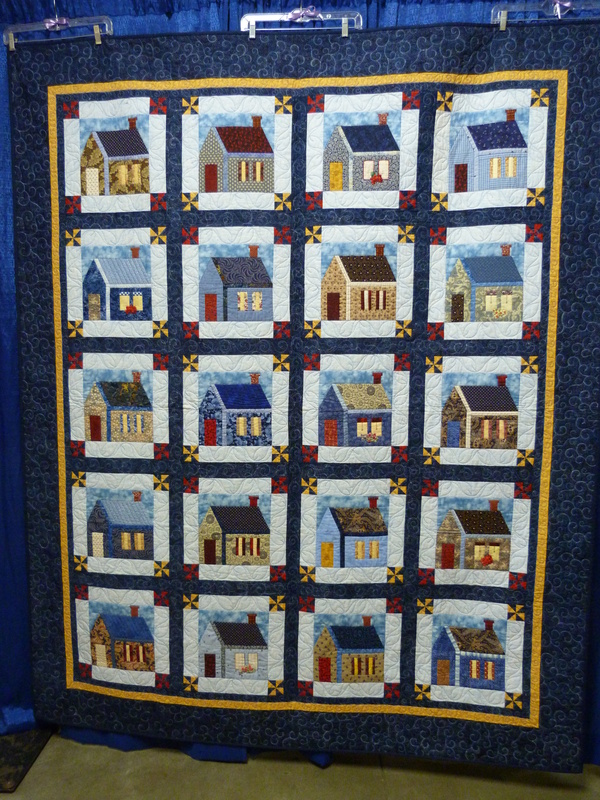 The guild’s biennial quilt show, entitled Through the Years, 1985-2015, is coming up soon on April 10th and 11th in Pearland. If you are in the area, it promises to be a great show and not to be missed. 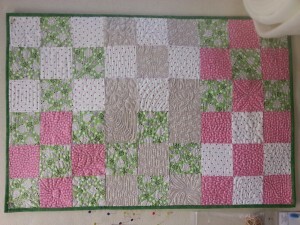 See the blog next week for the second raffle quilt. 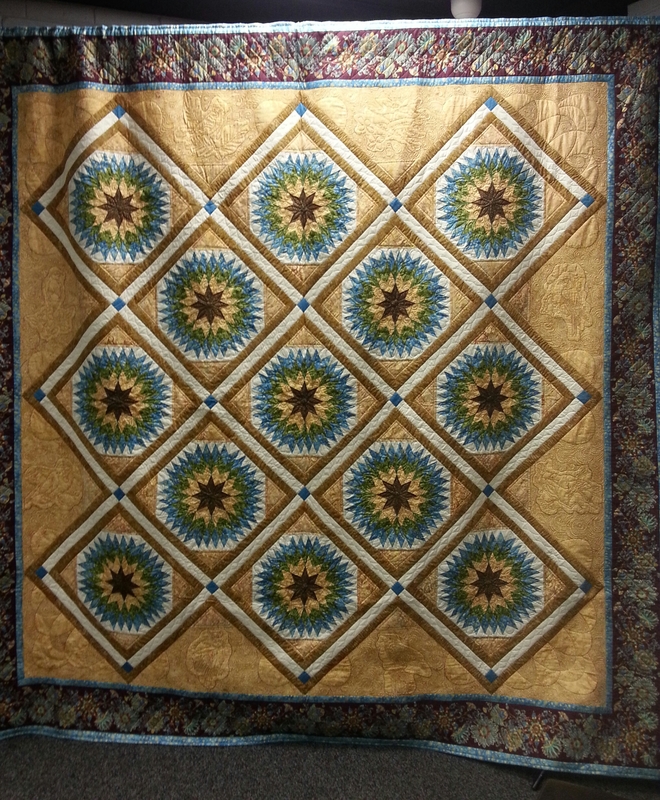 On my recent teaching trip to Texas, I visited Quilt Your Own, in Stafford (outskirts of Houston). Owner, Chris Ginkens runs a community quilting studio where clients who have completed a three hour private rental orientation class, may rent long-arm quilting machines for $34.95 per hour. 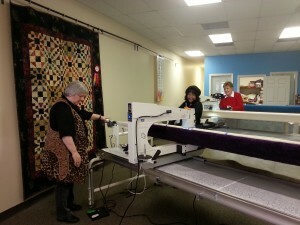 All the machines are professional quality APQS. 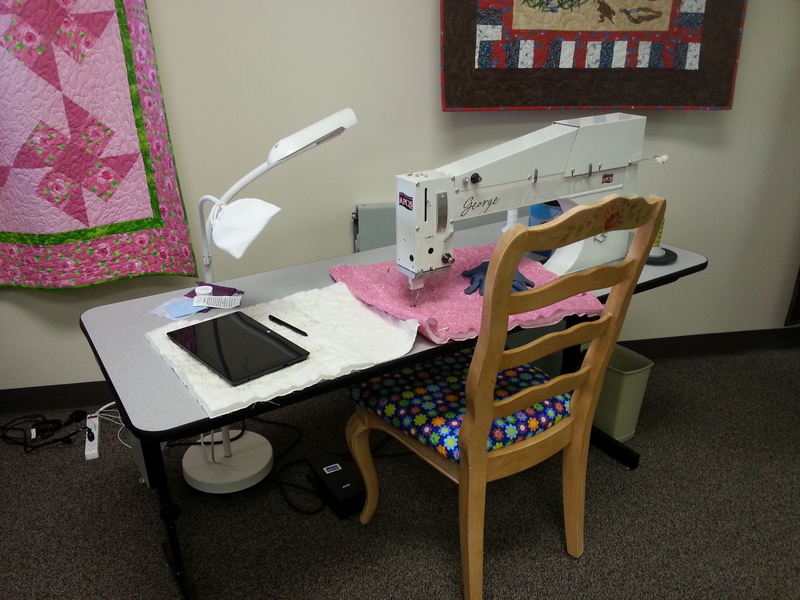 There are three large long-arm machines and a sit-down mid-arm. 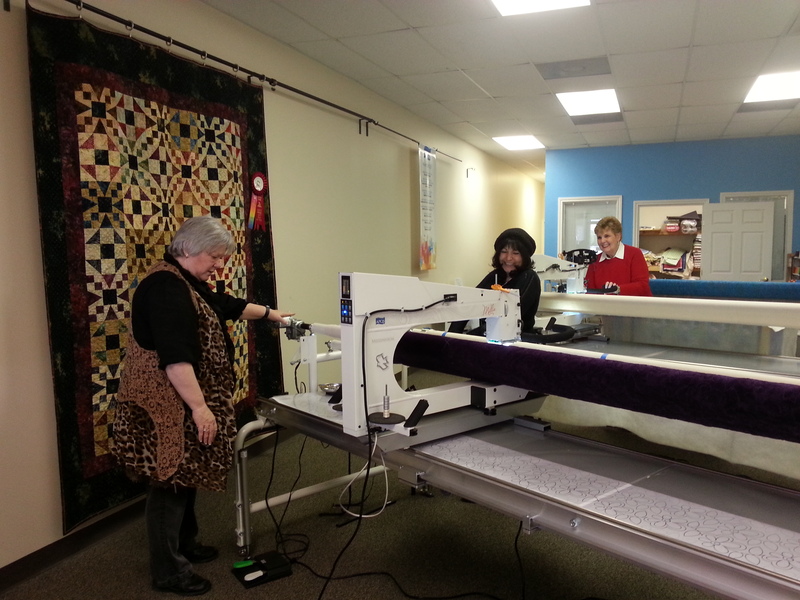 They have batting and wide goods fabric available for purchase and members of staff ready to assist the quilters. 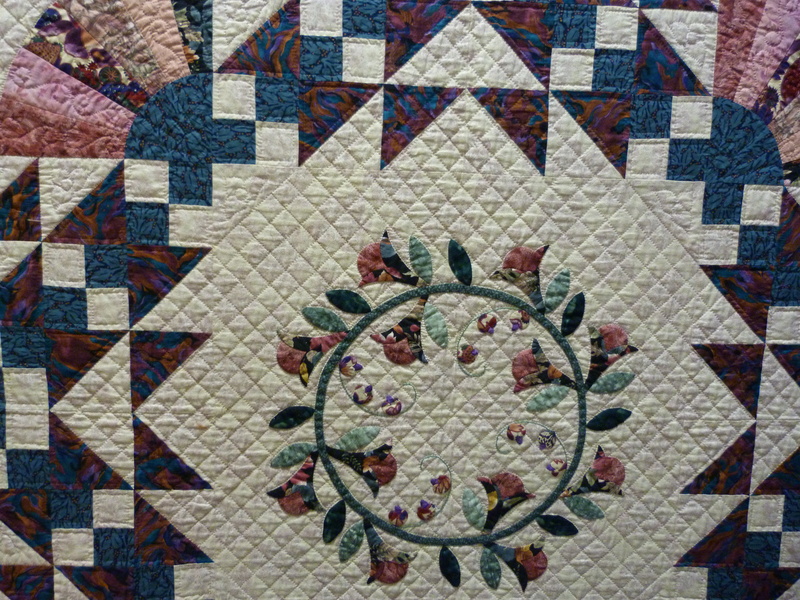 The nine-patch quilt is a quilting sampler with a variety of all-over quilting patterns. 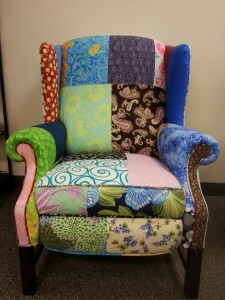 For quilters wanting to take a break, there were two wonderful armchairs. 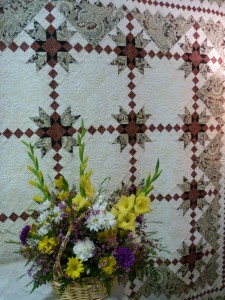 Chris made sections of patchwork from her choice of fabrics and then turned the project over to Sophie’s Upholstery, a business operating a few doors away, to complete the upholstery. 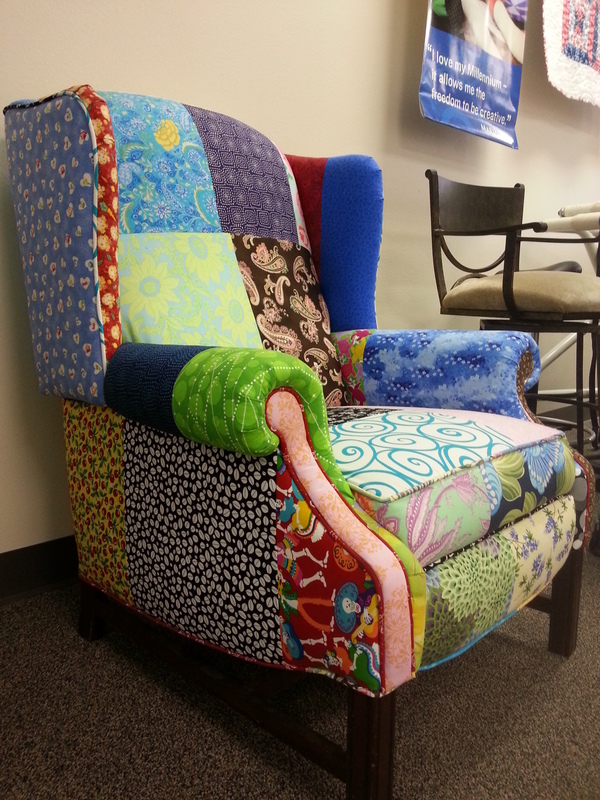 I loved these bright and cheerful chairs. 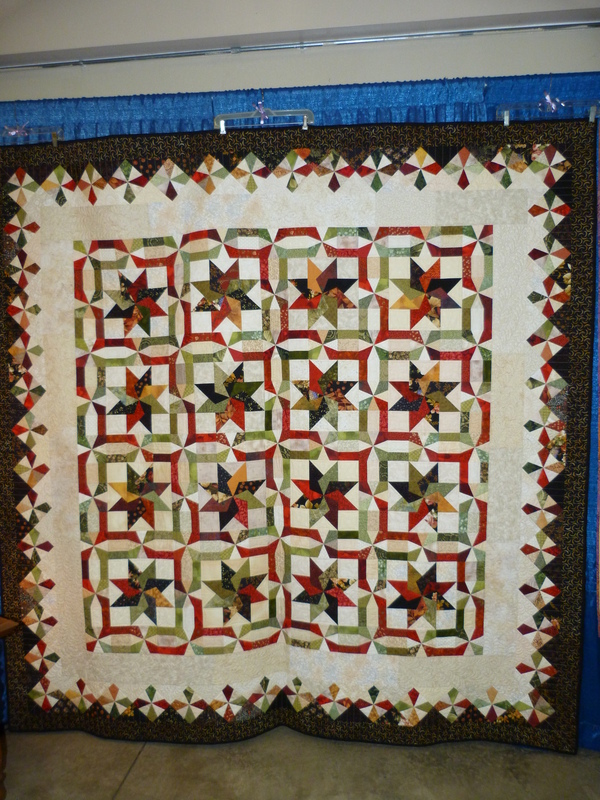 Our featured artist at the Kitsap Quilters Guild show was Sharon Broom from Bainbridge Island. Sharon has been quilting for nearly 25 years after being persuaded to give quilting a go by a friend who was a quilter. Since retiring from secretarial work in the Bainbridge School District, she has more time for her quilting projects. 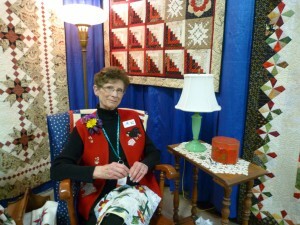 Here is Sharon in her display area featuring at least a dozen of her quilts. 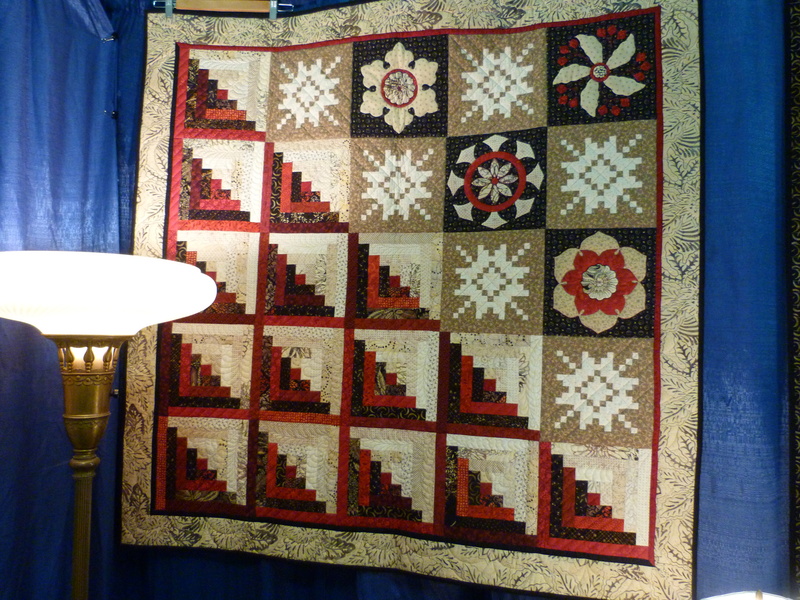 I’ve seen her quilts over the years at our quilt shows, but loved seeing them altogether as a collection and testimony of her outstanding work. She is a precision piecer and loves to applique. 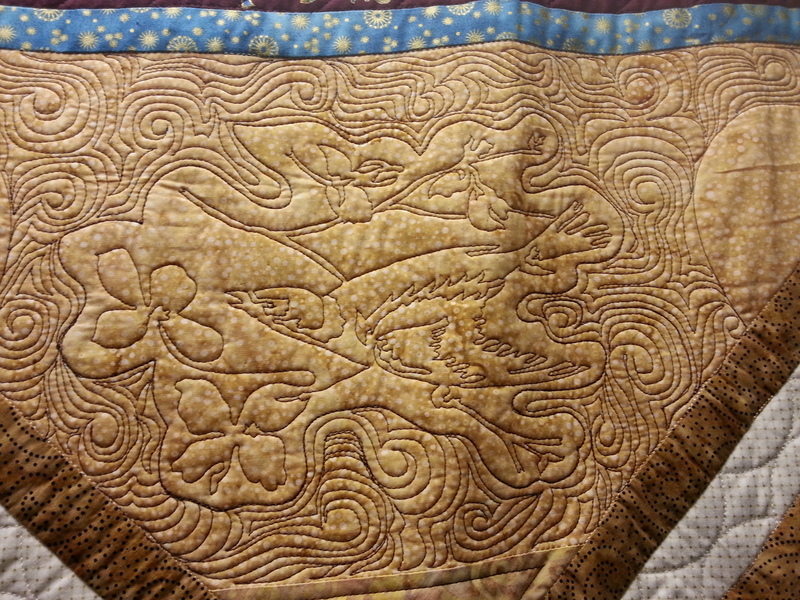 This lovely fans bed quilt combines her piecing and applique skills and is also beautifully hand quilted. 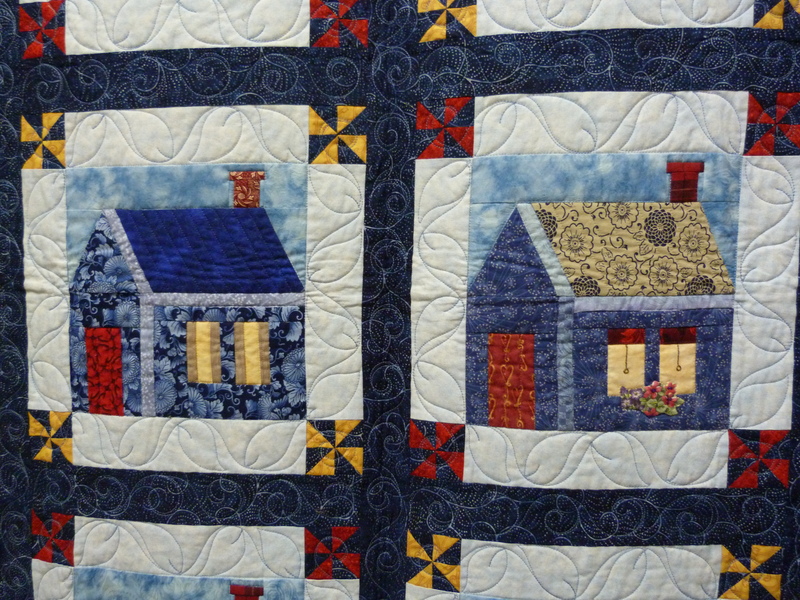 In the Schoolhouse blocks quilt, Sharon embellished the houses with embroidery and appliqued flowers in the windows giving each one its own special touch. 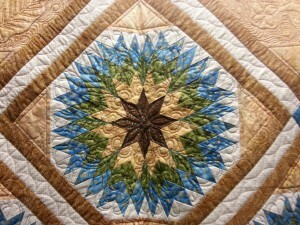 Sharon has a great sense of color and her quilts are vibrant with designs that pop. I love her sashing treatment of these stars. 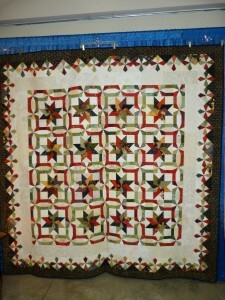 The Log Cabin combination with applique, and stars made from 1/2″ squares is stunning too. Her exhibit was inspiring and beautiful.